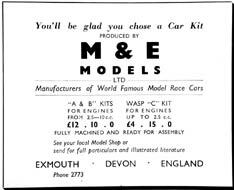 M&E Models was run by E.J and S.E Thornton and had its manufacturing base and main showroom in the High Street in Exmouth Devon. The company specialised in commercial model manufacturing with their own extensive workshop facilities. 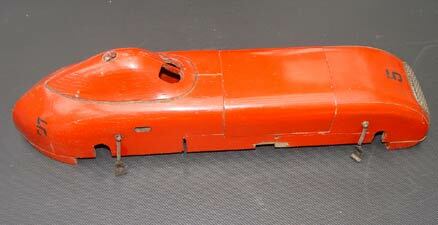 Included in their range were locomotives and rolling stock for model railways and a range of model ships, boats and yachts with materials and kits and accessories as well as their own steam plants. A team of craftsmen were responsible for producing this vast range of items although a few products from other companies were also on offer. All the boats ships and yachts were carved by hand from built up lime and pine and whilst perfectly finished on the outside showed all the saw, chisel and gouge marks on the inside. In 1947, following a year of intensive development, the company introduced a 'range' of tethered racing cars. 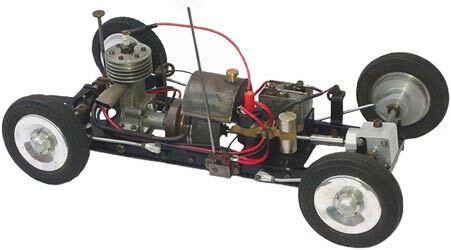 These cars were all based on the same chassis from steel rails with folded steel cross members, engine mounts and mounts for coils, condenser and batteries. Wheels carried scale Dunlop Fort or Cressite tyres with suspension for the front axle/gearbox unit and the steerable rear axles. A very solid clutch and flywheel unit was included along with a semi circular fuel tank and ignition 'knock off' switch. Impressive scale and semi scale, hand carved, softwood bodies completed the models and were the only real difference between the models in the range. Parts were available individually or as sets. 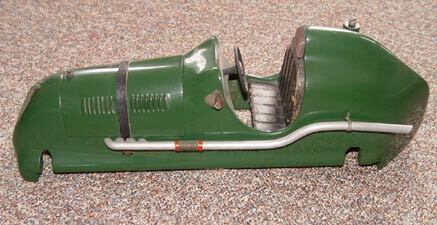 In 1948 the smaller and simpler Wasp was introduced to meet the demands of Class C racing, for engines up to 2.5cc. 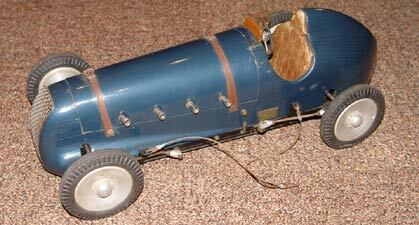 This car had no suspension and one driving wheel only and was again available either as a kit or completed model. Both cars were available directly from Exmouth or through a network of dealers such as Bud Morgan and Gamages. The M&E operation was struggling in the post war climate as the market for the hand built premium models had all but vanished and the manufacturing methods used were labour intensive and did not lend themselves to mechanisation. 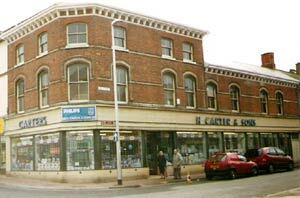 M&E Models was offered for sale by Leslie Fulford, a business agent of 5, Goldsmith Street, Exeter, in November 1949 as a going concern to include the remainder of the lease on the workshop. 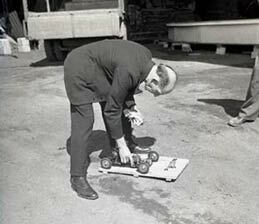 There is no evidence that the company changed hands although the manufacture of tether cars ceased soon after. Mr E.J Thornton was responsible, along with others, in forming the Exmouth and District Society of Model Engineers in 1946 and acted as chairman for a number of years. The premises in Exmouth still exist and are currently occupied by a large electrical retailer while M&E cars and parts regularly appear for sale and are amongst the more common of the commercial items found. Photo taken in 2004, thanks to Bill and Pat Langley. 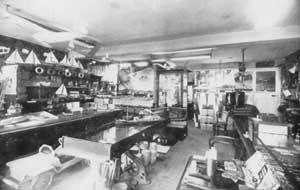 Inside view of the Exmouth showroom and workshop. A modellers paradise. On show are powered aircraft, gliders, ships, yachts and bare hulls. The back wall has a range of handsaws displayed and in the foreground is a child's pedal car. Leaning against the showcase are buckets and spades for the passing tourists. Adverts started in 1947 stating that demonstration kits had been despatched to stockists 'all over the country' and that kits 'will be available shortly'. Later advert illustrated here includes the 'C' Class Wasp and contained basic information about the two kits. Only the original adverts made any claims about the quality of the kits. As can be seen from the photo below, the claim that the kits were 'fully machined and ready for assembly' were accurate, and probably unique amongst British manufacturers at that time? 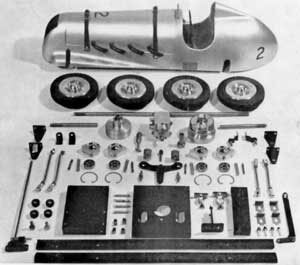 The standard kit for engines from 2.5 to 10cc showing all the individual items including the two pieces of steel curtain track which made up the chassis sides. No fuel tank battery box or tether brackets are illustrated here. The Challenger and Special bodies were supplied as standard with the kit. A very nice scale GP Austin body and an incredibly detailed ERA were also available to special order at a premium price. Chassis numbers can be found on the rear chassis member and started from 1000. Early numbers up to approximately 1150 were on a separate plate and after that punched directly into the rear chassis member. The earliest car known is the 3rd to have been built. The highest number discovered so far is 1769 while the 1642 shown here was on a spare part that never found its way into a kit. The body numbers are more of a mystery. They can be found punched into the timber and aluminium bonnets, starting from 1 with the highest so far 133. We believe these may relate to individual craftsmen, or even order numbers? 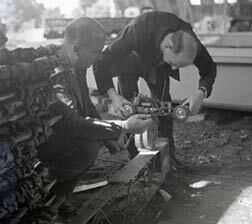 M&E introduced their tethered cars at the Model Engineer exhibition in 1947. 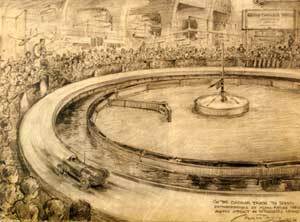 A feature of the hall was a circular tank for boats with a track for aircraft, and tethered cars round it. The Chief Engineer of M&E (Mr Thornton) demonstrated their cars on the track throughout the exhibition and shown here is the Special bodied version going through its paces at 40mph. A correspondent in Model Engineer chided Mr Thornton because his white workshop coat was dirty and showed 'lack of professional standards'. Miquel de Rancougne. Sold at Christies in 2004 for £763. The photos below are believed to be of Mr S.E. Thornton, co director of M&E Models and a member of the Pioneer Model Car Club. 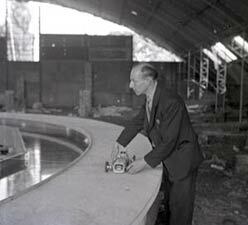 The images were taken during a trial run for the circular track and tank seen above at The Horticultural Halls. The model in each case is the M&E Special. 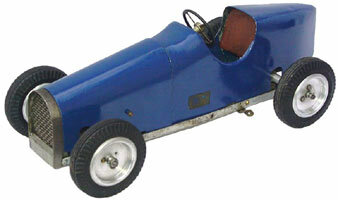 The standard chassis kit with the rear engine mounting option showing a 6cc Stentor fitted. Smaller engines could be mounted on a pylon in place of the fuel tank. An advertised feature was the spring loaded drive shaft which could be removed without taking the car apart. Tether brackets could be fitted either side of the car to allow for clockwise or counter clockwise running. The ignition switch however was handed and could only be use for one direction of running. The standard kit with either the Special or Challenger body retailed for £12-10-0, worth about £500 today. All four body styles were hand carved and left 'rough' on the inside. The 'Special' body was for use with the rear mounted engine option. 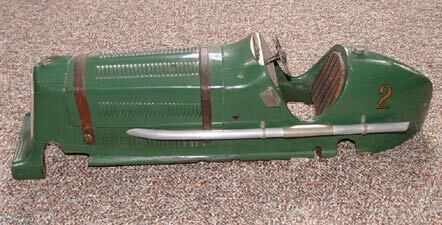 The scale ERA and Austin 750 bodies were to special order and cost £3-10-0, some £140 at today's prices. Currently (2016) 25 cars with Special bodies have been identified, 8 with the ERA, 10 Challengers, but only 2 Austin GP versions. 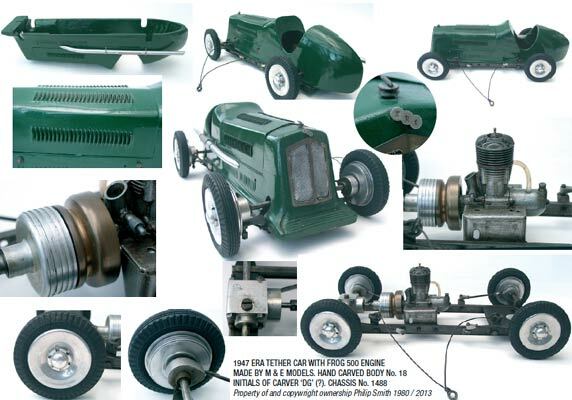 Right: Collage by Philip Smith of M&E ERA with mid-mounted Frog 500 motor. The smaller Class C Wasp for engines up to 2.5cc. Usually found with ED 'Penny Slot', ED MKII or MKIII units mounted on a wooden block. The front inside wheel was driven through a small clutch unit and bevel gearbox while the outside wheel ran free. The rear wheels ran free on an axle that was pivoted in the middle to allow the car to 'steer'. The kit was available at 95/-, 25p less than £5 and included the 'Bugatti' style body and radiator grill. Both cars featured upholstered seats. The eagle eyed will spot that the chassis below would actually run backwards, not the first we have seen put together incorrectly. Thanks to Dennis Williams, Alan Whitehead, Philip Smith and Bill and Pat Langley. 1947 images by courtesy of the Westbury family.